Modelled on the lines of the English Premier League by the Board of Control for Cricket in India (BCCI), it was positioned somewhat like a reality show - more entertainment than cricket complete with cheer girls, dugouts and on-field interviews. There was instant buy-in. Multi Screen Media paid no less than $1.2 billion (around Rs 5,800 crore) for ten-year television broadcast rights. Advertising revenues generated by IPL 2, held in April 2009, were reported to be 50 per cent higher than IPL 1. Image: Yuvraj Singh celebrates with Kumar Sangakkara after claiming his second hat-trick of the tournament. Multi Screen Media should rake in a profit of Rs 1,000 crore (Rs 10 billion) over the ten-year period of its contract. Where IPL has scored is the simplicity of the format - eight teams, each a franchise, play against each other in matches that start at 6.30 or 7 pm and last just under four hours. While almost all of India's top cricketers have found a place in the teams, the big money has lured international players as well. BCCI hasn't really needed to do much to create the buzz in a cricket-crazy country, though cheer girls have added to the glamour. The team owners, for their part, haven't cut corners, splurging on television spots, hoardings and even DVDs. Image: Members of the Rajasthan Royals cricket team wave to crowds during a street parade in Cape Town by teams competing in the Indian Premier League T20 cricket tournament. And they've tried to create loyalty by selling merchandise - lassi tumblers, mugs, badges, jerseys, caps, shoes and T-shirts - much of it available on eBay. Team websites have chronicled every happening. Film stars have been roped in to add glamour - Akshay Kumar for Delhi Daredevils, Hrithik Roshan for Mumbai Indians and Katrina Kaif for Royal Challengers Bangalore. Some film stars, of course, have invested in the franchises: Shah Rukh Khan in Kolkata Knight Riders, Preity Zinta in Kings XI Punjab and Shilpa Shetty in Rajasthan Royals. India may not have had the club culture necessary for such a format, but the concept was a hit from day one. Despite being held outside India, with more afternoon matches and alongside the general elections, IPL 2 attracted an audience of 90 million, which was more than IPL 1. Image: Bollywood stars Shilpa Shetty, Preity Zinta and ShahRukh Khan (L-R) confer during a news conference of the Indian Premier League T20 cricket tournament in Cape Town. Little wonder then that IPL now constitutes roughly 8 per cent of the television ad pie. Of course, spots sold at a hefty premium on both the editions of IPL, the challenging economic environment notwithstanding. That's important because the primary revenue source for IPL teams is broadcasting rights - 40 per cent. That's unlike the western sports leagues where gate receipts and match day sales hold the key. Team owners, of course, have forked out large sums to buy teams - Mukesh Ambani paid nearly $112 million (Rs 545.14 crore) for Mumbai Indians, while Vijay Mallya coughed up an equivalent sum for Royal Challengers Bangalore. 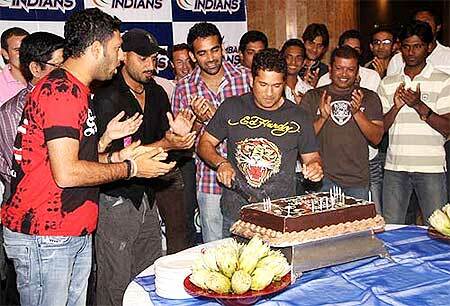 Image: Sachin Tendulkar's birthday party. Every team has signed on star cricketers. As a result, players' fees account for the biggest head at 60-70 per cent of expenses. Sponsors, on their part, have been more than willing to team up with franchises. Brands that Shah Rukh Khan endorsed, like Nokia, were naturally keen to back his team, Kolkata Knight Riders. The franchises aren't doing badly either. A couple of them are believed to have broken even. Indeed, all teams should turn profitable in the next two or three years. Some owners have already monetised their franchises. Emerging Media, which had paid $67 million (Rs 326 crore) for the Rajasthan Royals team, sold 11.7 per cent to Raj Kundra and Shilpa Shetty for $15.4 million (Rs 74.8 crore), valuing the firm at $132 million (Rs 641 crore). Image: Bangalore Royal Challengers dancers entertain fans during the 2009 Indian Premier League T20 cricket tournament between the Mumbai Indians and the Bangalore Royal Challengers. Divestment: India's new financial mantra?